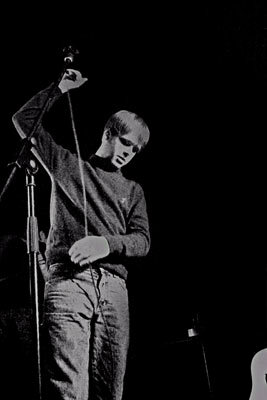 The Coral, more than any other band, have re-ignited not just the Scouse music scene with the Deltasonic label, but also a much wider birth if you scratch under the surface. Looking at them now sitting in the shadows of The Zutons it's easy to forget what an impact they made when they unleashed the beast that is "Skeleton Key". Their influence is still omnipresent over the scene as it was the Coral themselves that revived producer Ian Broudie's interest in music and he now in turn is producing albums from bands as different as The Subways and Manchester's heroes in waiting The Cardinals. With "In The Morning" becoming an anthem for the Jo Whiley and Wankster Moyles it seems the Coral are back to claim their crown back....or are they? First up though was singer songwriter Nathan Burton who originally hales from North Wales (which may explain why he looks like a dopelganger for Radio 1's Huw Stephens), but is now a fully adopted Manc on the Northern Ambition label. Manchester has a long tradition of singer songwriters and it's easy to see Burton added next to the likes of Damon Gough and Stephen Fretwell. "Going Out Of My Mind" showcases his talents perfectly, but there's a sense throughout his brief set that he really needs a band behind him to shine. Fresh from repeated airplay of "I Bet You Look Good On The Dancefloor" from Zane Lowe, Arctic Monkeys have bagged the support slot on the Coral's "Invisible Invasion" tour. Carrying on the traditions of The Futureheads and Maximo Park they push their accents to the fore like musical Huw Edwards breaking through the conservative Queens English bullsh*t. Musically it's a melange of Talking Heads style funk and new wave angular riffs with the subtle flourishes of the Libertines on the closing track. Alex Singer takes us through beat poet style passages of birds he's had, birds he can't get, dodgy nightclub bouncers and the excesses of youth. Providing you don't get lost along the way there's something captivating about these post-modern poets to witness further interest. The Invisible Invasion doesn't so much surprise, but The Coral deliver what we've always come to expect hence doing the equivalent of a double bluff. "She Sings The Mourning" is built around a insistent backbeat and a minimal guitar riff it's very much the sea-shanty's we've come to expect from our scouse brothers. "Don't Think You're The First" raises the bar before dropping slightly for another newie in the form of "So Long Ago". An acoustic strumathon, it's one of the Corals most simplistic straightforward songs and while it's pleasant you wish they hadn't sawed the edges off. The whole show is this constant tug of war between the eclecticism of the earlier tracks and the more straightforward pop of the new album. It couldn't be more apparent than with the duel attack of "Simon Diamond" from the bands debut with it's slow gregorian chants and influences drawing from sources as varied as Captain Beefheart and Tetris. The comeback single "In The Morning" is infectious for all the wrong reasons and while we love it now, 2 months down the line murders will be committed if we have to listen to either this is that c**ty Amarillo song again. Still it's better than "The Operator" which does a complete opposite and has no recognizable tune whatsoever and drones along like Spiritualised have raided the wrong drugs cabinet. "Come Home", a trad blues verse meets a twilight zone chorus with a psychedelic outro before reaching it's climax fairs much better. With some old classics to fall back on The Coral just about rescue tonight from passing by as a bad mistake. "Calendars and Clocks" has the emotional range of a Tarrantino movie - death, laughter and the surreal moment taken from some obscure Japanese movie that only Tarrantino's ever seen. "Pass It On" has the sound you feel the band we're aiming for on the "Invisible Invasion", but this former single still has the energy of the more eclectic tracks. "Skeleton Key", their debut single, is a reminder of how the band used to sound like and why many fans tonight were entranced by their spliffed up scousadelica. Ending on the closing tracks from the new album, "Arabian Sand" sounds like Fall and constantly threatens to launch into a straight rock tune and the closing "Late Afternoon" is a touching and effective ballad. With a mixed bag of new material it's hard to imagine where next for the Coral. What we loved about them was their ability to surprise and draw influences other bands were too limited to consider. While the lack of atmosphere may be down to the fans being unfamiliar with the new album, tonight's show was far removed from the 20 minute jam they did live on Radio 1's One Big Sunday at Heaton Park or the explosive Manchester Apollo show a couple of years back. Raw, young, honest and perceptive Sheffield quartet Arctic Monkeys combined bemusement, catchy instrumental loops and a little endearing provocation that oozed out early on in’ Bet You Look Good On The Dance Floor’ to capture attention early on. Alex Turner’s slightly coarse but very commanding Johnny Borrell ordering a taxi with Dominic Masters almost chatty vocal range, delivered tales of the seedy and sordid lives of your average Joe and Josephine with succinctness and pungency in the searing; ‘Scummy’ towards the latter end of a bold and veracious set. The Wirral sextet humbly shuffled onto the tight stage with maturity and grace, as they are now classed as veterans, despite the fact that most of them are in their early twenties and are younger than most members of the Franz Ferdinand fuelled art pop movement that is spreading across the world. 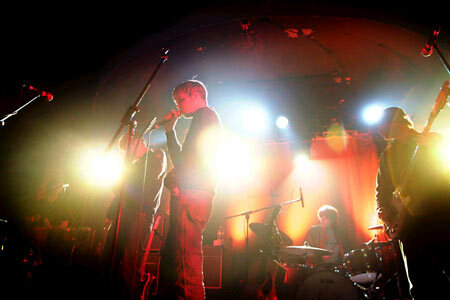 Opener ‘She Sings The Mourning’ was a tight, emotive slightly dark but laid back offering that was followed by fellow new number; ‘So Long Ago’; extracted from their forthcoming third album proper 'The Invisible Invasion'. In the latter it was as though The Monkees had fully evolved and taken heart and crispness as far as nature intended it go. James Skelly’s vocals have become tenderer and are as comforting as ever. The beginning of the much awaited ‘Magic & Medicine’ offerings; ‘Don’t Think You're The First’ elicited some rumblings in the pit and new folk tinged single; ‘In The Morning’ was enthusiastically performed with the echoing vocals, relaxingly hanging in the air like the smell of freshly baked bread. Great as it was to witness the calming maturity of the band, there was the hope, deep down that they had not lost their rugged edge and their ability to depict society's downtrodden. My fears and those of many of my fellow crowd members were emphatically allayed, by the double whammy of first album dark horse; ‘Simon Diamond’ and second album's rat race decrying; ‘Bill McCai’. These were sung back at Skelly by the front few rows, with the passion and belief of Everton fans communicating with Gary Neville. Old favourites ‘Calendars & Clocks’ and ‘Shadows Fall’ had lost none of their spice or zest, but The Coral continue to beat a new and golden path, you would be advised to follow and enjoy the journey.